Today is 9 Cimi, or Death; a very powerful Maya calendar day, which combined with the energies of this potent full moon for releasing inspire me to share this with you. There are 9 lords of death, all present with us on 9 Cimi. 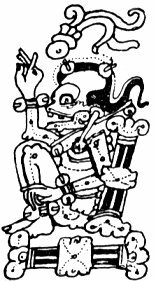 Death is embraced as the necessary compliment of life and endings are welcomed and honored, as they should be, in Maya society. Use the now waning but very full moon, with the energies of release, transformation, and molting which are so very potent today.